Performances in June and September. Plot - Appears to be Gaiden Dark Kingdom according to cast list. Are these new actresses? I haven't seen the most recent musical so I can't tell. I'll miss Yuga Yamato as Tuxedo Mask as I always enjoyed her performance. I'm kinda torn now thought --- I live in the country so plane tickets are needed for me to see stuff in Tokyo. So how many retellings of the Dark Kingdom arc do we have now? Literally my first thought when I saw that. Still, I'm excited this musical isn't going to be 100% cast from this random idol group as I originally feared. And I'm excited that Umino and Naru will be included! I said before that if they were going to do the DK arc again, I'd want them to include some supporting characters, so I'm happy that's happening! I'm not really bothered that they're doing the Dark Kingdom story for this musical since it's just a Sailor Moon/Nogizaka 46 collab; I'd be more annoyed if the musical next year did the DK arc. 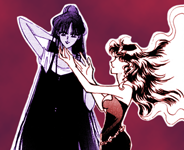 I was distracted by Pluto as Tuxedo Kamen that I didn’t even realize that Naru and Umino were in this! Honestly, La Reconquista was a fantastic musical so I’m curious how this one will fare as a new adaptation. Honestly, the new musicals can have trained circus monkeys playing the Sailor Guardians in a 4 hour adaptation of the dinosaur episode from R and I won’t complain. At least, the musicals consistently deliver year after after with no crazy delays unlike certain other branches of the franchise. ^ "Kunzite: Ando Chihiro"; "Nephrite: Shin"
I was trying to find links to their biography pages but couldn't hence why I wrote not sure. ^ Ah, I see now. 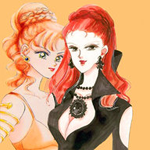 On the basis that it's not Takarazuka actresses taking the lead and well the choice for Queen Beryl is........o.O it didn't seem like something worth being disappointed about ( miles not withstanding) paying cash a return to Tokyo is $224 from where I live and well after the cost of the ticket and eating / subway costs in Tokyo it comes to close to $400 for a day out. Bit too much of a gamble for me . Not coming to Osaka either is very disappointing - that might have swayed me a little as it's closer to where I live. I'll still watch it if they stream it on Rakuten TV or the like but I'll wait till next year to actually go and see again in person.